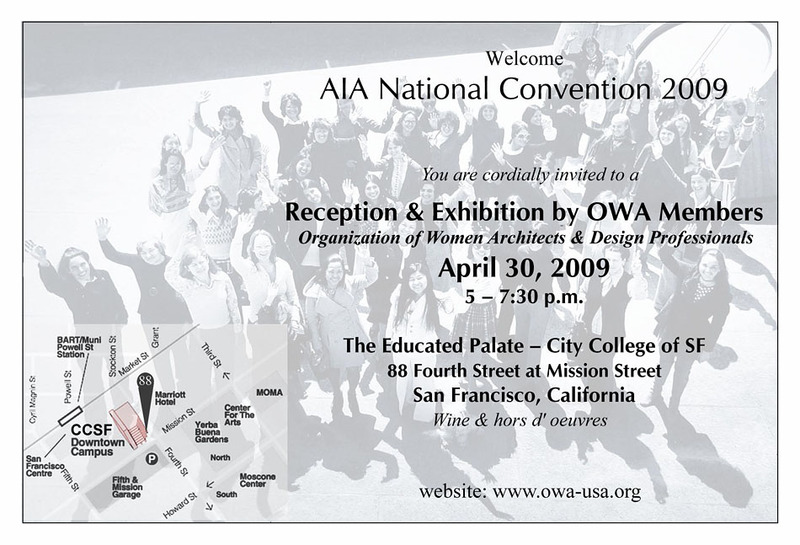 Per a majority approval by our general membership, the OWA Steering Committee and Event Committee will be hosting a reception on Thursday, 30 April from 5:00- 7:30 pm during the AIA National Convention in San Francisco for OWA members and their guests. It will take place at the Educated Palate Restaurant at the San Francisco City College Downtown Campus, 88 Fourth Street at Mission Street. 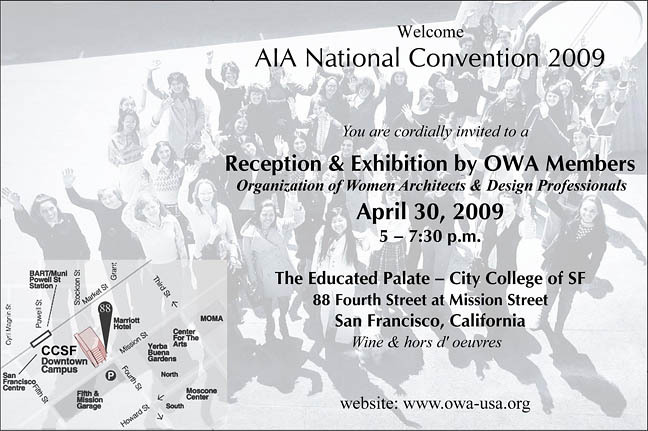 Students from the Culinary Arts Program of City College will serve wine and a creative selection of hors d'oeuvres using an architectural theme. 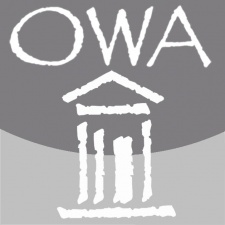 The reception room will have 20-30 easels showcasing the work of our members on a 30â€� x 30â€� boards mounted to 3/16â€� black foam core (see below) along with a looped PowerPoint presentation. Those interested in submitting exhibition boards, can email their interest in advance to djang@barcelonjang.com to hold an easel and place for their board. There is limited space so please place your reservation right away. Selection will be based on a first come first serve basis. 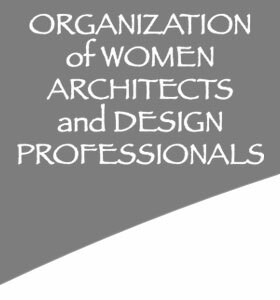 The Convention is quickly approaching so donâ€™t miss this unique opportunity to showcase your work and publicize the success of our organization. The next Convention opportunity to do this is likely 10-15 years away. For the 30 x 30 board, please place your name or the firmâ€™s name (if applicable) at the bottom right hand corner of the board along with address and/or website. Deliver your board in protective paper wrap to the office of Barcelon & Jang, 315 Bay Street, 3rd Floor, San Francisco, CA 94133. Call 415-834-0248 if you need other arrangements. Deadline for receiving boards shall be on or before April 24, 2009, 6 pm. The fee for submitting boards will be $15.00/board. Following the reception, please pick up your board at Barcelon & Jang between May 4th and May 15th 9:30am- 6pm. In addition to submitting a board or in lieu of, members are also welcomed to display their work on a PowerPoint presentation that will flash on a screen in the restaurant during the reception. Email or submit a CD with digital jpeg images 300 dpi, limit 5 images per member. The fee for the PowerPoint presentation is $10.00 for up to 5 images. Again, contact Carolyne Orazi or Darlene Jang with your interest or any of the members listed below. There is a lot of work still to be done coupled with busy schedules and a very short amount of time left, so any help with this event on the part of our members would be greatly appreciated.